A Path To Lunch: Dining with Artusi - Where Italian Cookbooks Began. 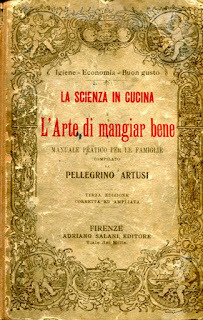 L'Arte di Mangiar Bene, 3rd Ed.1897. A Practical Guide for Families. Artusi never married, and as soon as his fortune was secured he followed his interests. He lived in a dignified town house in Florence with only his butler and cook, and two beloved cats, Bianchino and Sibillone, to whom he dedicated the first edition of his cookbook. His first two books had been about the poets Ugo Foscolo and Giuseppe Giusti. They were self published and were kind of a flop. His third book was 'Science in the Kitchen and the Art of Eating Well', and publishers universally declined it, so that book, too, he self published. The initial print run in 1891 was 1,000 copies, but as the new middle class with their new prosperity flourished, Italians wanted to entertain, wanted to impress their guests, and the book took off. 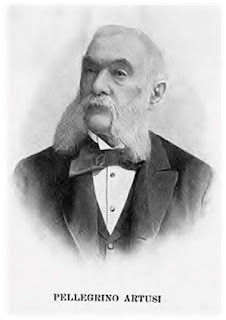 Before Artusi died in 1911, over 200,000 copies of the book had sold. It was one of three famous Italian books of the time – the other two are Pinocchio and Manzoni's classic, The Betrothed. Heady company! 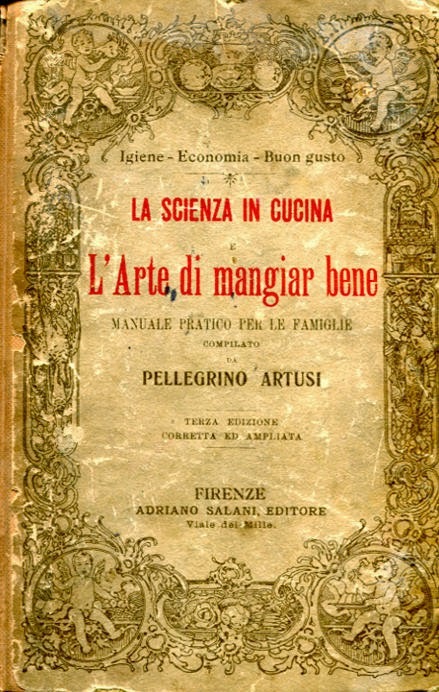 Artusi oversaw 13 editions of his book, and the number of recipes increased from 475 to 790. Artusi is well remembered today with many cookbook editions in many languages, and many adapted and derivative books. There are restaurants named after him in Seattle, New York, London, and a half dozen more cities. There's an Italian wine as well - and don't forget Artusi appliances. However, the best news for a visitor to Italy is that you can visit a festival held in appreciation of his accomplishments, and dine in a restaurant dedicated to his recipes and principles . Overview of part of the Festa Artusiana (Artusi Festival) in Forlimpopoli. 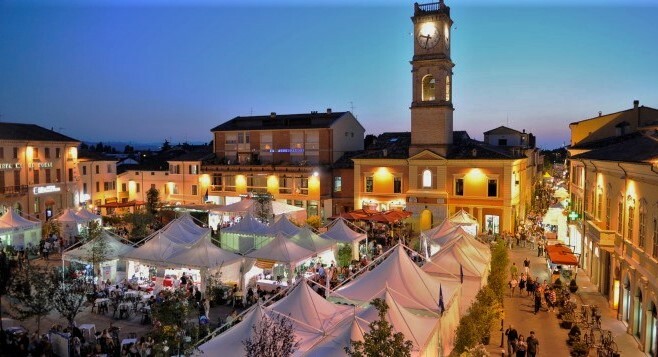 Artusi's hometown, Forlimpopoli, is a charming small Italian town in Emilia-Romagna, an hour by autostrada from Bologna. This town of 13,000 sincerely remembers and honors Artusi, especially since he left the bulk of his considerable fortune to Forlimpopoli to fund a place for the poor to live - he's a real home town hero. There's an entire Forlimpopoli institution devoted to the his cause: CasaArtusi. The facility in the center of town incorporates a library, museum, cooking school, bookstore, restaurant, osteria, and wine bar. They also sponsor an annual award - Premio Artusi, and several annual events. The largest event is the annual Festa Artusiana to celebrate all things Artusi. It occupies the large central piazza of Forlimpopoli and surrounding streets for a week. It's really a big festival, offering tastings, tours, lectures, concerts, art expositions, and a market area for purveyors of all types of food products and services. Artusi inspired theme menus are a big festival attraction - forty local restaurants participate with a serving capacity of 2300 people! The festival is held in late June (in 2019, June 22-30), and you can find information on it at Festa Artusiana (IT) and at other websites listed in More Info below. The 1st appetizer - reading the menu. Casa Artusi Restaurant, Forlimpopoli. The Casa Artusi Restaurant features Artusi's recipes or dishes inspired by him. We made a special trip to have lunch there in October. Many of the menu dishes list the recipe number from Artusi's book, so I took along my copy of his book to better enjoy the ingredients and methods. I was sheepish with it to start, but the staff quickly put me at ease and were happy to help me understand the dishes. Our lunch was extremely interesting, and remarkably well cooked. One of the restaurant's frequently available antipasti is Triglie col Prosciutto (recipe No. 468), which features red mullet, a mild, slightly sweet white fish. The recipe begins with a little aside: “The proverb is not always true: 'mute like a fish', because the mullet, the yellow croaker, and some others emit special sounds that derive from the oscillation of specific muscles, strengthened by those of the air contained in the swim bladder.” It goes on to tell in rather general terms how to marinate the fish, assemble it with the breadcrumbs, cheese, and prosciutto, and, finally but rather vaguely, to cook it “between two fires”. Honestly, it was delicious. The little smear of the creamy cheese called Squacquerone Romagna at the bottom provided savour to the barely grilled fillets of red mullet which - sandwiched by a crispy juicy flake of prosciutto and the breadcrumbs, generously seasoned with lemon rind and gently sauteed in butter - brought the whole thing together. Triglie col Prosciutto Artusi 468 Red Mullet & Prosciutto. We ordered the Minestra di Passatelli, one of the most famous of the local dishes, which came in a broth made of both chicken and beef (recipe No. 20). The passatelli are a pasta-like creation that starts with bread and they were surprisingly rich. I noticed that in recipe No. 20 there are two versions of passatelli given – I'm betting we had the second version, made with grated breadcrumbs, beef marrow, Parmigiana, eggs and egg yolk, a touch of nutmeg and lemon. I wish he gave a recipe for that terrific broth, but no such luck. Minestra di Passatelli Artusi Recipe 20 Passatelli in Broth. We also ordered Tagliolini alla Carbonara Romagnola but without the available tartufo (truffle). Ours came garnished with crispy guanciale. Both the pasta itself and the sauce were made with the yellowest, tastiest local eggs ever. The guanciale was wafer thin - like bacon without the smoke flavor - quite different from chunky Roman style guanciale . Tagliolini alla Carbonara Romagnola with Guanciale. Finally our last dish was Polenta with Mazzancolle. The polenta was made of mais biancoperla - a corn which is a particular specialty of the Veneto. This “wild” self-pollinating bright white corn is most commonly used to make a creamy, soft polenta, and is a slow food stalwart. Mazzancolle are a sweet, rich shrimp, served just barely cooked. The dish was topped with strips of crisp guanciale, dusted with paprika. Polenta con Mazzancolle. Mazzancolle Shrimp with Polenta. Altogether a great lunch or dinner experience, and one that's worth a trip to experience. It's a fairly large restaurant, but I'd suggest making reservations, since it's not exactly on the beaten track. If you wonder which dishes you'll order, look at the seasonal menu – it's on the Casa Artusi site in the restaurant section, but only on the Italian language version. Our lunch with one shared appetizer, two primi, one shared second, and two glasses of excellent wine was 71€ (10/2018). If the festival and the restaurant are not going to work in to your plans, you can make your own celebration by making some of Artusi's recipes. 'Science in the Kitchen and the Art of Eating Well' is readily available in italian all over Italy, I bought a copy in the local supermarket. You can also download a free .pdf of 'Science in the Kitchen and the Art of Eating Well' in Italian at the link below in More Info. It's also been translated in to many other languages, including English, and can be obtained from Amazon.com by following this link: Science in the Kitchen & the Art of Eating Well (English) (For UK: Click) If you buy using the link, we'll get around 90 cents for referring you – if we scrape together enough cents, we'll go back to try the agnolotti and let you know how they are! Casa Artusi Restaurant, Osteria, and Wine Bar: Casa Artusi Restaurant (EN). Hint: The Menu .pdf only visible by switching to the Italian version. Reservations advised.